Decor and staff are excellent. Loved the steam room and sauna. What a surprise! Our stay was a last minute decision and so glad we stayed! What a great idea for a hotel! Will definitely stay at the other 21c Hotels! Great hotel and close to everything. Excellent restaurant too. It was such a nice big room and we loved it. We only stayed one night but are hoping to come back at a later time for more. Great hotel! Incredibly comfortable and cool! Will stay here on every trip to Louisville! We arrived around 8 pm in a room there was ice bucket full of ice cubes just waiting for us and water in coffee machine.Love it. Great unique hotel in the heart of Louisville. The restaurant is worth a visit, if not two, chef Levon makes some tremendous dishes. Def. try the spicy chicken salad for lunch/dinner. Very pleasant and relaxing. My stay wasn't long enough. What a cool, one-of-a-kind place. They've got a museum downstairs with loads of interesting contemporary art pieces, but just about every corner of the place features something interesting to view: There's art in the elevators, the hallways and of course in the rooms. Great downtown location, too, close to the river and to some great museums and cocktail joints. I thought the price was very reasonable for the service, location and amenities. This is fun trendy spot in Louisville. Fun to walk around the museum with some bourbon or hang out at Proof on main. Good massage services, but gym could use an upgrade. Room is a little expensive for what it is but I liked it. I am a huge fan of the 21c hotel in Louisville. Great location, beautiful buildings, lovely rooms, awesome restaurant, great drinks & fantastic art 24/7. What more could you ask for? Enjoyed it very much, loved the attention to detail. Not cheap, but if you want to treat yourself, this would be a good place to do it! Such a fun hotel--unique museum on 2 floors, plus great amenities like steam room, sauna, 24 hour fitness room, great bath products in-room, turn down service--I could go on:). Only disadvantage--too much light in the room from curtains (hard to seal tightly) and under the door. Other than that, very cozy. Extraordinary staff! Reminded me a little of St. Martin's (with friendlier staff;). I stayed at the 21c Museum Hotel overnight while visiting friends. The hotel was located downtown close to the museums, the riverfront, 4th Street Live, and restaurants. Check-in and -out were easy. From the entrance to the room, the art was everywhere. This made for a really unique and wonderful experience. They bed and pillows were beyond comfortable. The bathroom was smaller, but the high ceiling alleviated a cramped feeling. I didn't have to worry about noisy neighbors or high hallway traffic, which is always a plus. There is an entrance to Proof on Main from the hotel; however, I didn't indulge. I opted for Spinelli's Pizza which was within walking distance. I would definitely stay here again and would encourage anyone looking for a unique, modern hotel to stay here. Only negative is parking. It all came at a fee, whether it was garage, valet, or on-street. We had never been to Louisville before and were super excited to stay at the 21C. Its a beautiful space and in a great location. The staff was courteous and friendly and very helpful. Our room was a little loud as we were next to the elevators, but it wasn't too bad. The rooms were very clean and nice, but I wasn't blown away by them. Overall it was an excellent experience and we will definitely stay anytime we visit Louisville. I found this hotel online, and I loved the concept. It is every bit as wonderful in actuality. It was a beautiful experience from start to finish. We've stayed at 21C several times, and we continue to stay there, even though it does seem pricey. However, the hotel is fun, it has a fabulous restaurant, it's close to nightlife, the staff is great, and the rooms are quite comfortable. We also love the free entertainment that comes with it...the art museum! We haven't found a better hotel in Louisville. Located in West Main Historic District, 21c Museum Hotel Louisville - MGallery is within a 5-minute walk of Louisville Slugger Museum and within 15 minutes of other popular attractions like KFC Yum Center. This 4.5-star hotel welcomes guests with 91 rooms and conveniences like free in-room WiFi, a fitness center, and a 24-hour business center. Sit down for a leisurely bite to eat at the onsite fine-dining restaurant, or enjoy a drink at the bar/lounge. Order from room service to satisfy your hunger without leaving your room. Start each morning off right with full breakfast served for a fee. A 42-inch LCD TV comes with cable channels, and guests can stay connected with free WiFi and wired Internet. Beds are dressed in premium bedding and down comforters, and the bathroom offers a hair dryer and designer toiletries. Other standard amenities include an iPod dock, a minibar, and an espresso maker. At 21c Museum Hotel Louisville - MGallery, guests have access to a fitness center, free WiFi in public areas, and conference space. Valet parking is available for USD 32 per night, and there's also limo/town car service. The 24-hour front desk has multilingual staff ready to assist with dry cleaning/laundry, luggage storage, and concierge services. Other amenities at this luxury hotel include a 24-hour business center, coffee/tea in a common area, and a computer station. Thank you for your review! I'm so happy to see you enjoyed your stay with us. The Red Penguins hope to see you again soon. Thank you so much for your review and for choosing to stay at 21c Louisville! I'm so glad to see you enjoyed your stay. Come back anytime! Thank you very much for the review. We are so happy to hear you enjoyed your stay with us! The Red Penguins are looking forward to your next visit. Hello Lana! Thank you for taking the time to review 21c Louisville. I'm so glad to hear you enjoyed your stay and Proof on Main. I hope you'll come visit again soon! Proof on Main - Restaurant and bar serving breakfast, brunch, lunch, and dinner. Recreation features at 21c Museum Hotel Louisville - MGallery include a fitness center. The preferred airport is Louisville, KY (SDF-Louisville Intl.). The front desk is open 24 hours a day. Driving? For a fee, this property offers valet parking, along with extended parking. 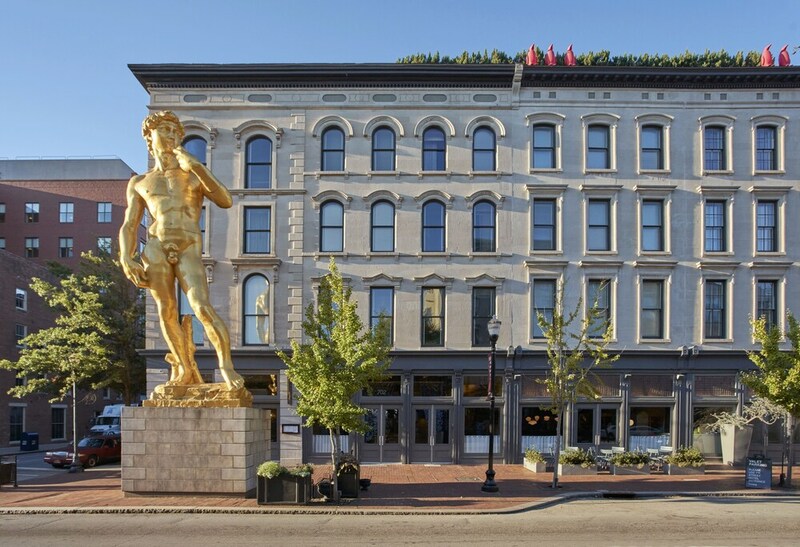 21c Museum Hotel Louisville - MGallery is listed in the 2014 Condé Nast Traveler Gold List of the world's best places to stay.